Take control of your wireless home network with the Archer A5 AC1200 Wireless Dual-Band Wi-Fi Router from TP-Link. 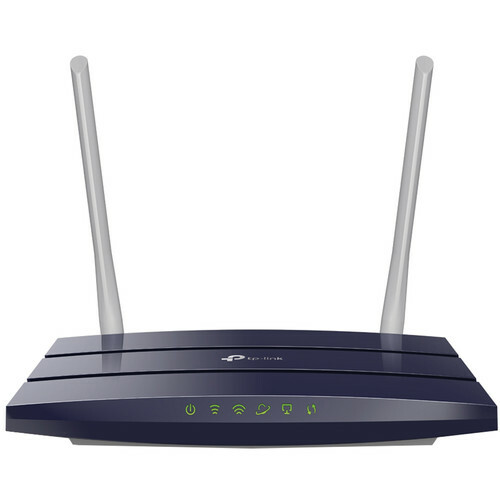 Equipped with a pair of external antennas and capable of up to 1200 Mb/s total Wi-Fi data throughput, the Archer A5 comes equipped with a Gigabit Ethernet WAN port and four Gigabit Ethernet LAN ports, ideal for wired connections to computers, game consoles, and other Ethernet-enabled devices. The Archer A5's bandwidth control features let you manage how much network bandwidth is allowed for gaming and streaming, or you can choose to limit connection speeds. Support for a separate guest network makes it easy to grant Wi-Fi access to visitors while helping to ensure network security. Parental controls let you restrict online access for children, while the TP-Link Tether App for iOS and Android lets you set up and manage your Wi-Fi network using your smartphone. Enables bandwidth management, allowing you to allocate more data for gaming or streaming, or you can limit connection speeds to keep people on task. Supports IGMP proxy/snooping as well as VLAN bridging and tagging to optimize IPTV streaming. Provides secure access for guests to connect to your Wi-Fi network. Easily share your network while minimizing security risks. Allows the network administrator to restrict access for children, as well as limit access levels and connection time. Select which devices are allowed to connect to your network to help keep it secure. Allows you to transform an existing wired network into a wireless network. Set up the Archer A5 in minutes thanks to its intuitive web interface and the Tether app for iOS and Android. The app also lets you manage your network settings, including parental controls and access control. Allows for secure, one-button Wi-Fi connections with supported wireless devices. Support for the IPv6 standard helps to future-proof your network.